Our very first book published by Two Poppies (an imprint of Multicultural Kids). Click here to order your copy today! Also available for purchase on Amazon. 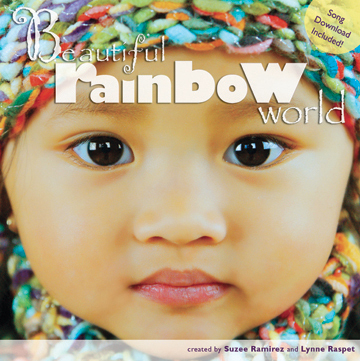 Beautiful Rainbow World is a bright, soul-filled photography book of global children that appeals to all ages. The stunning photos were carefully compiled to represent children from all around the world including Russia, France, Canada, Taiwan, Australia, India, Libya, Japan, the United Kingdom and more. This book has a simple yet profound truth to share ~ we are all truly amazing ~ each person, just as we are. The song Beautiful Rainbow World by world-renowned children’s folk singer, Daria, is included with each book via download which makes it ideal for sing-alongs! heartfelt gift ~ adoption, baptism, birthday, teacher appreciation, etc. Available for resale or library purchase through Ingram, Baker & Taylor, or contact us directly using the form below. Dancing together in the light… A beautiful rainbow world. No one lost or left behind… A beautiful rainbow world. Each one their own treasure finds… In this beautiful rainbow world. Languages and customs all delight… A beautiful rainbow world. We’re all so different, yet so alike… A beautiful rainbow world. Joyful laughter as we play… A beautiful rainbow world. Hugging and loving every day… In this beautiful rainbow world.